1. Calibrate your thermometer and Hygrometer!! Here is how I do it: Thermometers glass only-get a cup of crushed ice(use a blender) ice cup with cold H2O. Put thermometer about 2" in the ice H2O and wait I think 4 min, should read 32C or 0 F. If not see hygrometer on how to add or subtract. Hygrometer-Put 1 tablespoon salt and a few drops of H2O in a plastic bag mix until it looks like spackle add a few more drops if needed the salt needs to be wet. Put the hygrometer in bag and zip it. Wait 6-12 hours, I wait 6. It should read 75% If it reads 70% you will need to add 5% when read your humidity. If it reads 80% you -5%. I would mark this on some tape and put it on your incubator or the hygrometer. BTW don't let your salt mixture get on your hygrometer! 2. USE A WAFER THERMOSTAT!!! Hands down these are far more superior! 3. 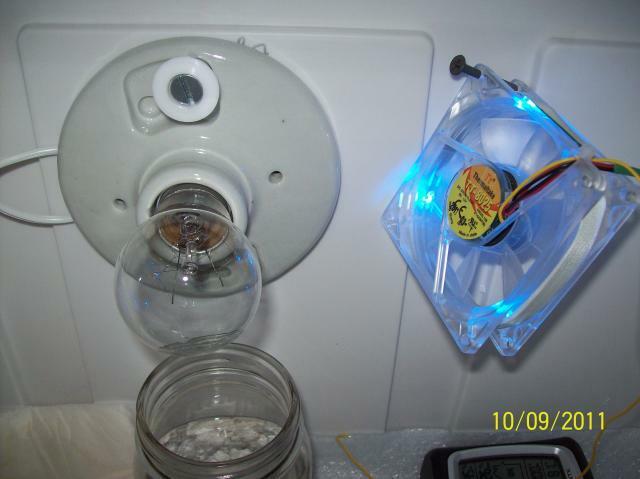 Use a fan in your incubator! Also don't let your fan blow air on your eggs! If this cannot be changed, I would put a cover over my eggs with a piece of insulbrite fabric to block the breeze or a washcloth. Mama hen doesn't have a fan blowing on her eggs! 4. I line my homemade coolerbator bottom floor with Insul-Brite fabric and lay my eggs on them and hand turn. I took out my wire floor because mine didn't fit that great and my eggs would bounce real bad on it. I had a chick that hatched and got trapped on the edge, luckily he was ok but in the procees of saving it, my other eggs got shook up real bad and that was the end of wire floor for me. The insul-brite can be washed and reused. 5. I now use bottled water inside my incubator for adding the humidity. This can be Desani, Aqufina, or Walmart brand water. I use a mason jar with fish gravel for humidity. Every few days I will clean this out using equal parts of vinegar and peroxide and some bottled H2O, rinse with hot water, drain and add the bottled H2O. I think this helps, its just cleaner. 6. Clean my incubator with vinegar and peroxide equal parts and a little water. Just a little over a tablespoon each and wipe clean. 7. WAS YOUR HANDS BEFORE AND AFTER HANDLING YOUR EGGS! "Oh but my hands will dry out!" Put lotion on after you wash when your done! 8. I tried the dry incubation and it was too dry for me. I incubate 100 degrees and 40-45% humidity. When I see wiggling day 17 or 18 I up the humdity to 50% if they lost enough weight, I up it to 65%. I have noticed it is hard for me to get my humidity up past 55-60% on day 18 but towards the end of day 19, it(humidity) will finally start to go up. 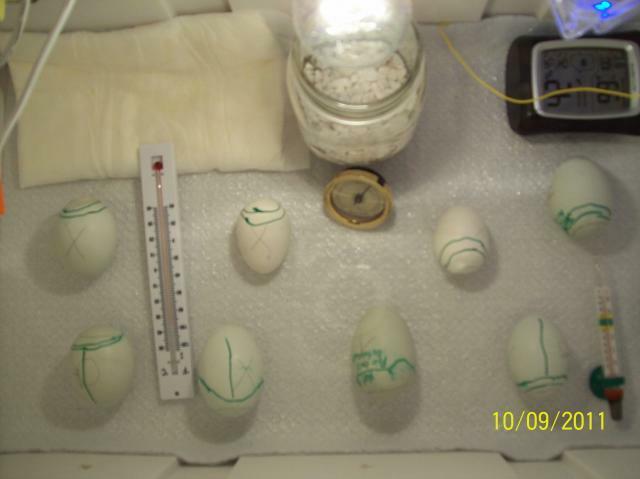 Also it is normal for the humdity to go up when they are hatching! I use the flexibility approach of pete55 for the lockdown and hatching part.